An allotment site in Reading was impacted by hydrocarbons emanating from an adjacent railway depot. The hydrocarbons entered the allotments via a drainage system and were traced to an accidental leak from bulk fuel storage tanks. The event contaminated approximately a third of the allotments and triggered the closure of the facility following a site investigation of the contamination and the general soil quality by the council’s retained consultant Enviros. 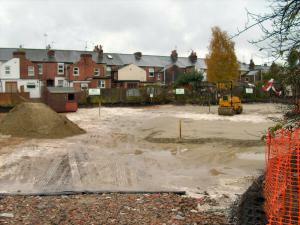 DEFRA funding was secured for the investigation, remediation of the site and development of a tender specification. 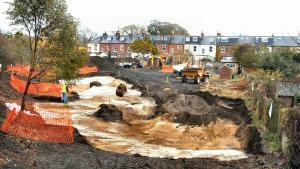 The site investigation by Enviros identified the widespread presence of hydrocarbons, including benzo(a)pyrene and metals associated with the ash and clinker component of the topsoil and subsoil. The site had also become contaminated from fly tipping including asbestos. The excavation work was completed within a programme of six weeks, despite inclement weather conditions. A collaborative approach allowed for the redesign of the phasing of the works, an alteration to the quantities of imported topsoil and mitigating impacts on local traffic flows, neighbours and environment. Carefully selected manufactured topsoil was then imported to the site, together with a subsoil, which had to meet stringent contaminant limits imposed by Enviros together with BS3882: 2007 “Specification for topsoil and requirements for use”. A new access road was constructed together with an amenity area and shrub / tree planted areas. The work required consultation with local neighbours, owners of an adjacent nursery and Network Rail (railway line on embankment adjacent to site boundary). The project was completed within budget and has been praised by the consultant and Reading Borough Council.